It’s Rosh Hashanah! 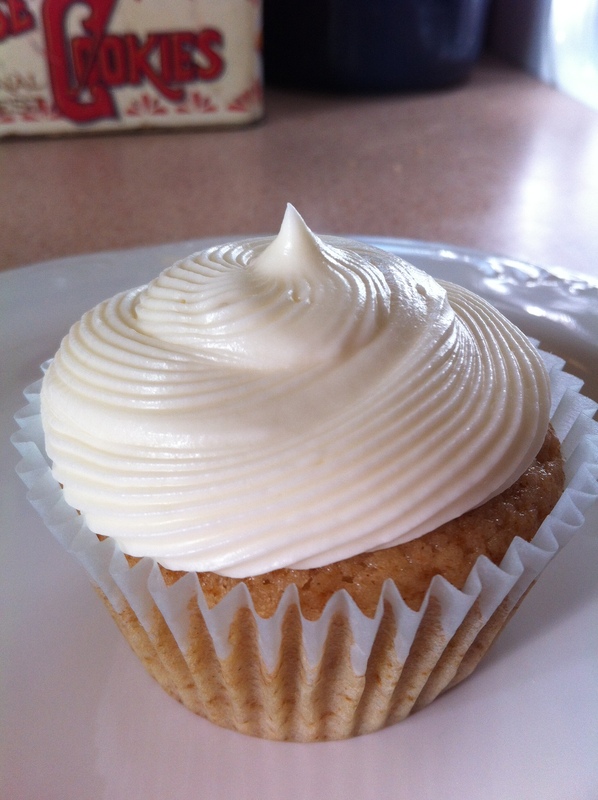 Tonight in the interfaith Kozusko-Marcus household we are celebrating with sweet foods, including these honey cupcakes with honey cream cheese frosting. Many of the recipes I’ve seen for Rosh Hashanah desserts involve apples, or honey, or both; most celebrations tonight will feature apples dipped in honey in the hope of a “sweet new year,” and you can learn about this fun tradition from the fine folks here at aish.com. To me, honey cake is the Rosh Hashanah dessert…but a whole cake for just Mike and me seemed like a bit much. Are there honey cupcakes, I wondered? Indeed, there are. And why I’ve never baked them before is truly one of life’s great mysteries. As many of you know, honey cake was my baking nemesis until a few years ago, when I found this great honey cake recipe. The cupcake version uses a completely different recipe, and is absolutely delicious, with a great aromatic twist from the cinnamon and lemon zest. I doctored up a frosting recipe that I found online to include vanilla extract to cut some of the sweetness and it worked very well. Happy New Year, all! Leshanah tovah tikateiv veteichateim! Preheat oven to 350 degrees. Line cupcake pans with paper liners; my batch yielded 16 cupcakes when cups were filled about half to three-quarters full. In a small bowl, combine flour, baking powder, salt, and cinnamon; set aside. In a mixing bowl, cream butter and brown sugar until light and fluffy. Add eggs, vanilla extract, lemon zest, and beat until well-combined, then add honey and beat until well-combined. With the mixer running on its lowest speed, gradually add flour until the mixture is just combined, then add milk and mix until just combined. Scrape sides of the bowl frequently to fully incorporate all ingredients. Using a two-inch cookie scoop, scoop batter into cupcake pans, filling about half to three-quarters full. Bake for at least 17 minutes, then check cupcakes for doneness; if cupcakes are not done, continue baking for 1-2 minutes and checking after each interval to be sure they don’t burn. My cupcakes baked for about 21 minutes. Remove from oven and cool for just a moment in the pans, then cool complete on wire racks. In a mixing bowl, beat cream cheese and butter until well-combined and fluffy. Add honey and vanilla extract and beat until very well-combined. Add powdered sugar, one half-cup at a time, beating well after each addition. Scoop frosting into a piping bag fitted with an open star or large plain tip; I used Wilton #199. Pipe frosting onto cupcakes; you will have more than enough, so reserve any unsued frosting in an airtight container in the fridge; I had about a cup left over because I didn’t pipe a ton onto each cupcake. Various web sources claim that you can store cream cheese frosting in the fridge for a few weeks, but I’d use it quickly…maybe bake a one-layer cake and use the rest on that. Store frosted cupcakes in the refrigerator, but bring to room temperature before serving.